A TOAD (or dingy, in RV language) is the extra vehicle you tow behind your motorhome. It’s used for sightseeing and other activities once you have parked your RV or set up camp at the campground. 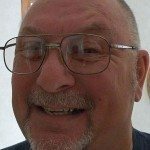 There are a number of ways you can pull your auxiliary wheels behind you. Serious thought needs to be given before you decide what type of vehicle will suit your needs best, and which is the best way to tow it. First, you’ll want to verify with your state’s DOT (Department of Transportation) exactly what the legal requirements are in your state. Many states require that all trailers (or otherwise towed items) weighing over 1,500 have brakes. Some may wave this issue with cars attached by a tow bar. You won’t be sure what you’re dealing with until you check with the proper authorities. Here’s an overview of towing laws by state. There are 3 common methods of towing vehicles behind an RV. The one that’s best suited for your situation will depend on many factors. #1 – Your first choice is to carry the vehicle on a flatbed or enclosed trailer. This trailer will support the complete vehicle and will have its own brakes and light system, assuring its acceptance by all states. Advantages: You’re not adding unnecessary mileage to your second vehicle, and you can pretty much bring along any vehicle you choose. Disadvantages: Cost. This will be a sizable investment that will also dramatically affect your mileage. The total combined weight may very well be more then the capabilities of the average motorhome. For the average RVer, this isn’t a very practical solution. #2 – A second method is to use a tow bar, keeping all 4 of the car’s wheels on the road. This is a very common way to transport a vehicle behind an RV. Again, every state is different as to what is acceptable. 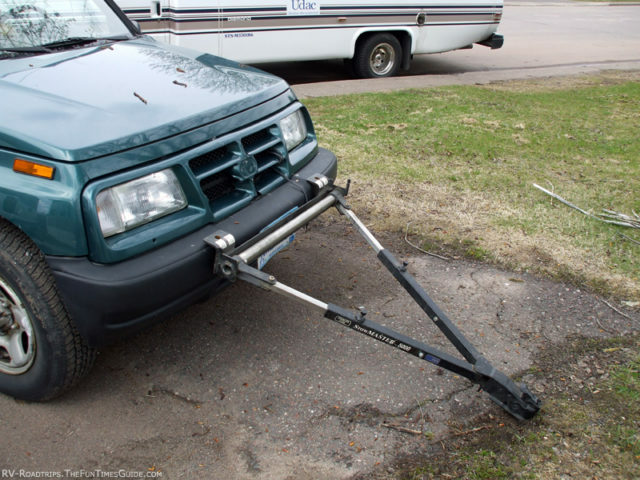 My own experience involves towing a Ford Festiva behind a 37-foot Bounder motorhome with a Stowmaster tow bar. Roadmaster is another popular brand. I had safety cables and the Festiva was wired so that its taillights were activated by the taillights of the motorhome. This set-up worked very well for our situation. The car was small, lightweight, and didn’t have any noticeable effect on mileage or handling. Must read: Towing An Automatic Transmission Vehicle 4 Wheels Down, like a Jeep Wrangler. One thing I like about tow bars is the fact that most of them fold up, making them small and compact for storage when not in use. The only disadvantage would be maneuvering backwards. 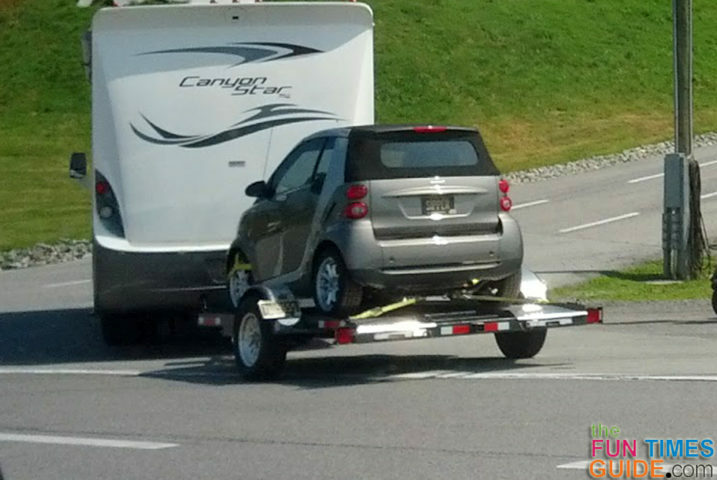 You cannot back up the RV while you have a car on a tow bar. Why? Because the front wheels of the car will turn the wrong way and you will drag the car — putting extreme stress on the steering components. You see, most motorhomes have an extended overhang to the rear. 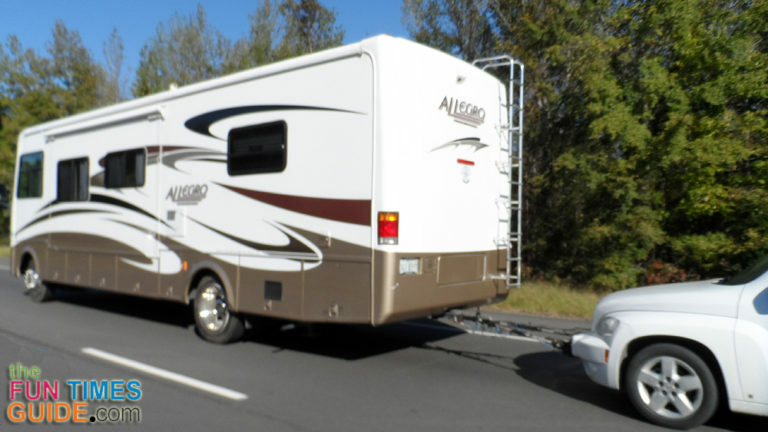 There are still many feet of motorhome beyond the rear wheels This magnifies the stress when attempting to turn in reverse. 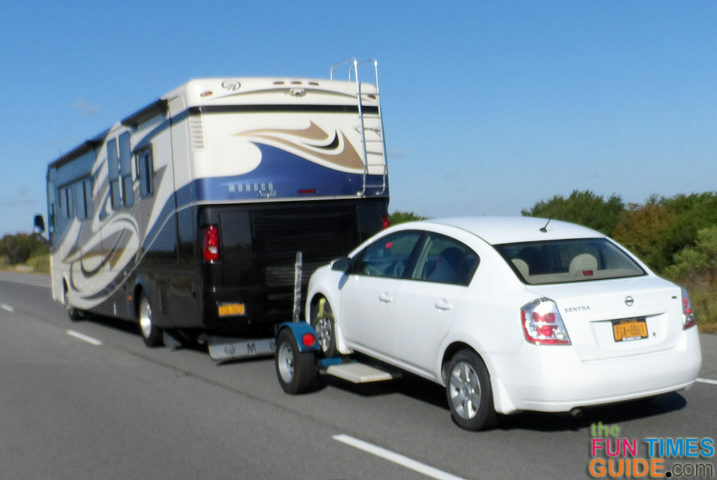 Serious damage will occur to your towed car unless you unhook it from the motorhome when circumstances arise and you are forced to back up. IMPORTANT: Don’t assume that because a vehicle is a stick transmission it can be towed. Not all cars can be towed with 4 wheels on the ground. Check with the manufacturer. (Often this is covered in your owner’s manual.) Many standard transmission cars can be towed, but not all. Some have a transmission lubrication pump that requires the engine to be running. Some automatics can be towed as well. Saturn is one manufacture that states their cars can be towed. 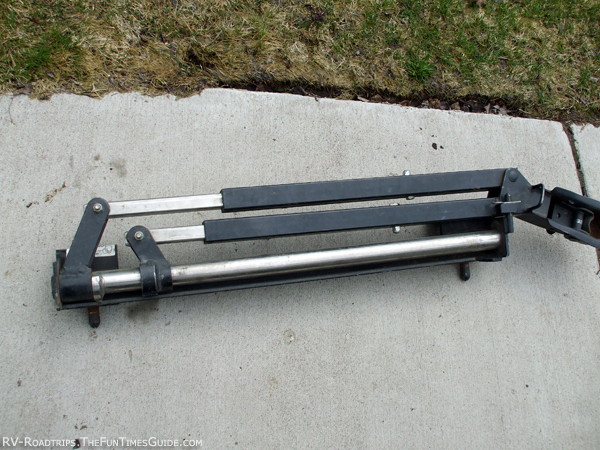 #3 – The final way would be to use a tow dolly. This is a good compromise. Front wheel drive automatic cars can be towed with their front wheels placed on the 2-wheel tow dolly. Manufacturers differ in how they construct their tow dollies. For example, Kar Kaddy has a steering system that mimics the natural steering when you tow with a tow bar. Other brands use a “wagon” method, as the required flexibility in steering is supplied by a center pivot point. The Kar Kaddy system is better, in my opinion. Tow dollies can have surge brakes, or even electric brakes — meeting the requirements of most states and allowing you to tow a more substantial car. You will still find it almost impossible to back up with a tow dolly, but at least you won’t be stressing the steering components of your car. Plus. using a tow dolly doesn’t add mileage to the odometer of your car. That is, assuming it’s the drive axle riding on the dolly. Towing a car is a serious matter. Whichever method you choose, be sure to have safety devices in place and fully operational at all times.